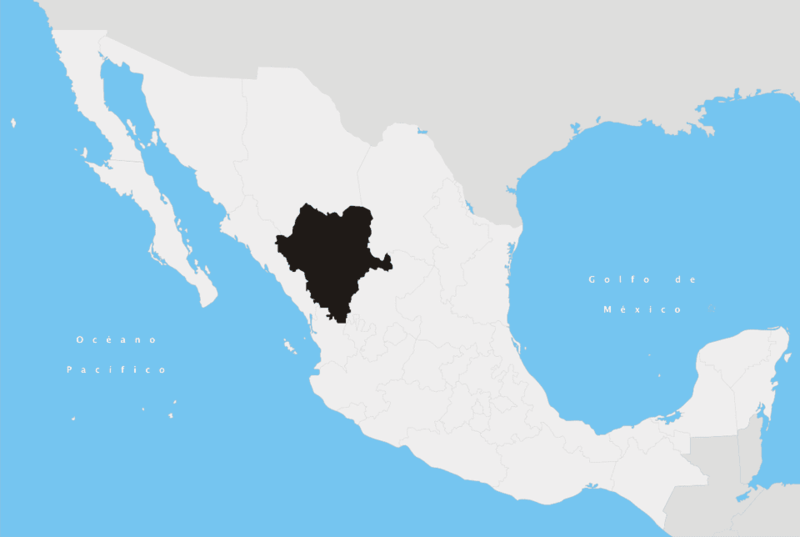 Durango is a state in northwest Mexico. Read on to learn information about population, area, history and major attractions. Topography: quite mountainous with the Sierra Madre to the west. Minimum altitude is 3,200 feet (1,000 m) above sea level. The highest peak is Cerro Gordo with an elevation of 10,960 feet (3,340 m) above sea level. The capital's historic center is one of Mexico's finest and attracts visitors with parks, plazas and charming colonial buildings. One of these colonial buildings is the former prestigious Seminario de Durango where Guadalupe Victoria, one of the key fighters for Mexican independence and the first president of Mexico, studied philosophy and rhetoric. Today, part of the former seminary houses the rectory of the Universidad Juárez. From the top of the Cerro de los Remedios you have a beautiful view of the whole city. Durango state is most famous for being home to Francisco “Pancho” Villa. Born as Doroteo Arango in the small village of Coyotada, the poor peasant boy who had been working for a wealthy landowner fled to hide in the mountains after having shot his boss to defend his mother and sister. During the turbulent years of the Mexican Revolution, he became one of its key fighters and heroes, not least due to the fact that he led the División del Norte (the Northern Division) to some victories that were founded at Hacienda de la Loma near Torreón with originally 4,000 men. Following the road north towards Hidalgo del Parral on the border in the state of Chihuahua, you will pass the Hacienda de Canutillo that was given to Villa in 1920 by President Adolfo de la Huerta in acknowledgment of his services and in agreement to lay down arms. Two rooms of the ex-hacienda now exhibit an excellent collection of arms, documents, personal objects and photographs. On the border with the state of Coahuila, the Reserva de la Biósfera Mapimí is an amazing desert region, dedicated to the research of fauna and flora. To the west of Durango city, the road towards Mazatlán on the coast leads through splendid mountain scenery. And movie veterans might recognize some of Durango’s countryside that served as the set for many Hollywood films, mainly westerns, featuring John Wayne and directors John Huston and Sam Peckinpah. Last but not least, Durango is an El Dorado for lovers of nature and extreme sports: the Sierra Madre offers great hikes to observe fauna and flora and adrenaline action like canyoning, mountain biking, rock climbing, rappelling and kayaking. Durango has an airport and good bus connections to other destinations all over Mexico.